We encourage you to only take requests you can accommodate to keep cancellations rare and your business booming. However, if you do need to cancel a booking, we offer all the tools you need to make it happen smoothly. 4. 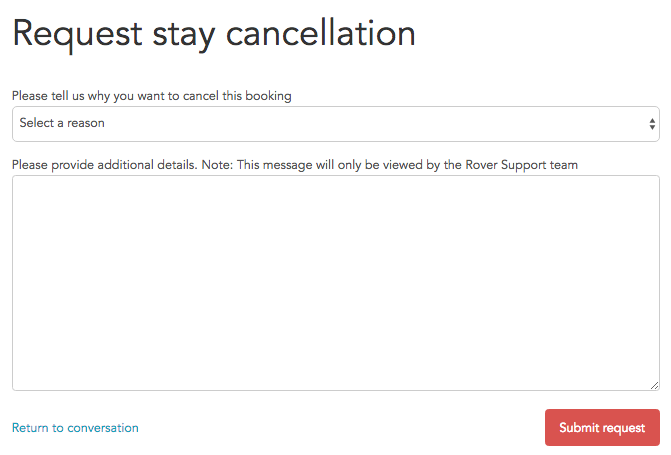 Select a cancellation reason and include details about why you’re canceling. This message goes directly to Rover Support and will not go to your client. Select Submit Request. 6. Select Yes, I want to cancel to cancel and refund your client. Important: A pattern of of short-notice cancellations may result in account review.